Kaitlyn Weaver and Andrew Poje perform their Free Dance at the 2019 Canadian Tire National Figure Skating Championships. 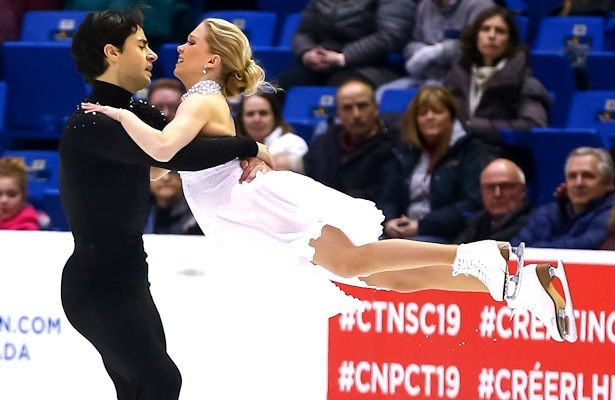 Kaitlyn Weaver and Andrew Poje, who won two national titles in 2015 and 2016, reclaimed their title at the 2019 Canadian Tire National Figure Skating Championships on Saturday. However, the margins were not quite so wide as they had earned in their previous championship wins. Piper Gilles and Paul Poirier who were less than two points behind, earned the silver, while Laurence Fournier Beaudry and Nikolaj Sørensen pocketed the bronze. Weaver and Poje placed second in the free dance, earning a score of 128.59, for a total score of 213.78 points. Skating to “S.O.S. d’un terrien en détresse” from the French musical Starmania, they earned level 4s on their lifts, twizzles, and diagonal step sequence, as well as for Poje’s half of the one foot step sequence. The program was inspired by Weaver and Poje having seen it performed by their late friend Denis Ten, but this performance had an additional cause for sorrow—the recent death of their friend John Coughlin. “This program, I think, is representative of losing those that are dear to you, and we’ve lost a very dear friend, so, the emotion was real today,” said Weaver. Both skaters praised the new choreographic elements introduced by the ISU for ice dance this season. Poje admitted to being initially skeptical. “Every year, the ISU comes up with new drastic changes, but we have to adapt to them and I really like the changes that came this season.” Weaver expressed her belief that they add “so much freedom” and room for creativity. Gilles and Poirier took first place in the free dance (129.23 points), but second place overall (212.31), earning their fifth silver medal at Nationals. Their routine to “Vincent (Starry, Starry Night)” has been earning plaudits since its debut at the Nebelhorn Trophy, and Saturday was no exception. The duo earned level 4s on all elements apart from their one-foot step sequence (graded at level 2 for Gilles and level 3 for Poirier) and the diagonal step, graded at level 3. After the rhythm dance, Poirier had noted that he and Gilles and set a goal of winning nationals this year, so there was some disappointment at the result to be expected. The audience’s response to the “Vincent” program continues to be a source of satisfaction for the duo. Fournier Beaudry and Sørensen capped a stellar beginning to their domestic competitive career for Canada that saw them triumph at summer and fall competitions and the Skate Canada Challenge. With 119.00 points in the free dance, and 198.41 points overall, Fournier Beaudry and Sørensen achieved their goal of “solidify[ing] a place in the top three,” more than twenty points clear of fourth. They received level 4s on their twizzles, the dance spin, and two of their lifts, with the midline step and curve lift at level 3, and both earning level 2 on the one foot step sequence. Both skaters took the time to reflect on the growth of the Gadbois training centre, which Sørensen and previous partner Katelyn Good joined when it was only four months into its operations and had only two teams. The “extremely motivating” environment and coaches Marie-France Dubreuil and Patrice Lauzon were praised, as well as the “amazing” opportunity for a time to train alongside Tessa Virtue and Scott Moir. As to how it might feel to skate at Worlds representing Canada instead of Denmark? “I have no clue,” Sørensen said. Haley Sales and Nikolas Wamsteeker rose from fifth place to fourth in the free dance and overall, with a score of 167.60 points. Carolane Soucisse and Shane Firus, who had made the decision to revive their previous season’s Lady Gaga/Tony Bennett duet free dance for nationals, dropped to fifth place overall (163.48 points) after a performance where Soucisse struggled on her twizzles and fell toward the end of the program. Skate Canada named the top three teams to both the Four Continents and World Figure Skating Championships.